Gerrit Dou was a Dutch Golden Age painter, whose small, highly polished paintings are typical of the Leiden fijnschilders. He specialized in genre scenes and is noted for his "niche" paintings and candlelit night-scenes with strong chiaroscuro. At a comparatively early point in his career, he developed a distinctive manner of his own which diverged considerably from Rembrandt's, cultivating a minute and elaborate style of treatment. He is said to have spent five days in painting a hand, and his work was so fine that he found it necessary to manufacture his own brushes. His pictures were always small in size. More than 200 are attributed to him, and examples are to be found in most of the major public collections of Europe. 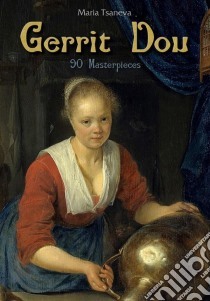 His most noted pupils were Frans van Mieris the Elder and Gabriël Metsu. He also taught Bartholomeus Maton, Carel de Moor, Matthijs Naiveu, Abraham de Pape, Godfried Schalcken, Pieter Cornelisz van Slingelandt, Domenicus van Tol, and Pieter Hermansz Verelst.